Through IGA Community Chest we’ve helped raise well over $70m to help local communities. 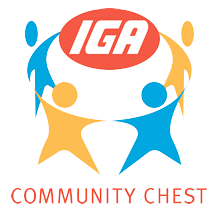 Every day across the country IGA Community Chest raises funds to support local communities, charities and other worthwhile causes. It could be in response to a major event like a flood or bush fire, or something as simple as new soccer balls for the local under 8’s. Look for products with an IGA Community Chest logo on the label. When you purchase these products a percentage of the price is added to the Community Chest fund, which is then distributed via the local IGA to community organisations. IGA Community Chest and associated programs have raised over $70 million for local community groups, not-for-profit organisations, charities and other worthy causes. This money has assisted over 7,000 worthwhile causes.